MALAYSIA – Defender Bernard Agele has completed a move to Malaysian side, Universiti Teknologi Mara (Uitm) Football Club. Agele, born in Uganda to South Sudanese parents, signed a two year deal as a free agent after a brief stint at Uganda Premier League side, Paidha Black Angels. The rock solid center half is excited having excelled in the trials as well as the medicals to be deemed fit for a slot in the Malaysian side. “Glory goes to the Lord for this job, said Agele after signing. “I will keep focused and work hard as well for all my time at Uitm Football Club. “I will do my best for the best performances alongside my other teammates. Last season Uitm completed the season in 9th place. 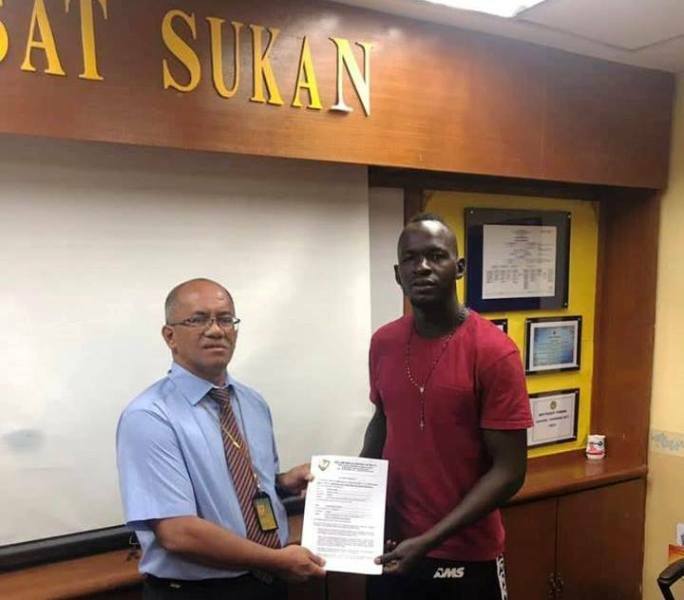 Agele’s debut at Uitm is expected to come on Friday, 1st February 2019 they travel to Polis Diraja Malaysia (PDRM) at the Majlis Perbandaran Stadium, Selayang during the opening match of the 2019 Malayisa Premier League, a second tier in the country. Previously, Agele has played at Sports Club Victoria University (SCVU), Express and recently Paidha Black Angels. He is capped 15 times for the South Sudan national team.